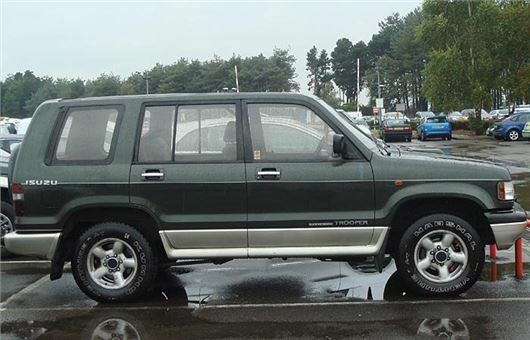 My third Isuzu Trooper is getting old and tired; the tin worm is getting worse, so time for a change, but what? No more Isuzu jeeps are made. I tow on occasions, fold the seats and use it as a skip on occasions. It goes off road occasionally, but it also needs to take out family, be comfortable and well equipped; side steps are a must because none of us are tall. Would a Shogun be a good replacement? I've heard horror stories about Range Rovers, Discos, etc. I have up to £20k to spend. Isuzu still exports pick-ups to the UK: single cab, extended cab and double cab. I've bought a few because I rate Isuzu Rodeos / D-Maxes / Chevrolet Colorados as probably the best, with the nicest 2.5 and 3.0 litre engines and the best gearboxes. Ford Rangers are very tempting, but a bit bigger. The latest Nissan Navara with coil spring rear suspension has the least bouncy ride. And the best value is the immensely tough Ssangyong Musso. But yes, if you want a big SUV, a Shogun or a Ssangyong Rexton would do the job. The shift to electrically driven vehicles is inevitable; it is just a matter of time. Electricity generated from non-polluting sources such as solar, wind, tides and nuclear, etc. will also continue to increase at a pace. Advances in battery technology will also continue to improve efficiency, for example by the use of new materials such as Graphene. The National Grid will have to be upgraded sooner rather than later to accommodate this shift. Solar power generation requires sun. Wind generated power requires breezes (but not too much wind). Hydro-electric power requires flooding valleys. Nuclear power creates nuclear waste (and investors aren't keen on the extremely slow return). Graphene is interesting but is still too heavy. Gove has already said he will shut down coal, oil and gas fired power stations in the UK by 2025. Existing infrastructure cannot carry the required amperage. By 2040 we will still need internal combustion engines, even if many of them are powering hybrid cars. I have had a clutch problem with my Ford C-Max and wish to take the cost of the repair to Small Claims. Where can I find the evidence that this is in fact, a common problem? I witnessed a cyclist run into a car on a mini-roundabout in a town. It was rush hour, getting dark and damp. The traffic was stationary but moving in short spurts. The cyclist moved out from his normal position riding on the left of the stationary car queue next to the pavement across the front of my car onto the outside of the traffic and meandered along the central white line. What he couldn’t see was that the leading vehicle three or four cars up and stopped at the mini roundabout, signalled a driver from the left hand side road to cross over the moon roundabout to the other side of the road to proceed towards us. The cyclist was unsighted by the cars on his immediate left and carried on, hitting the offside rear of the car coming form the left. He fell off his bike and subsequently needed treatment in hospital and had some medical complications even though the accident was a 0-5 mph event. I immediately stopped and offered the female car driver who had been hit to be a witness because in my view the cyclist was clearly to blame. I witnessed at least one other driver offering to do the same. I wrote that and a description in a report to the police and to her insurance company. Now, some twelve months later, I checked with the female car driver to discover she had been advised by her insurer to accept a 50/50 blame compromise. The insurer says that it would be rare for her to win in court if she continued to claim he was 100% to blame. She was so fed up with the hassle of the whole business that she was about to agree. I told her to beware and to get proper legal advice because a 50/50 solution might open her to be being sued in the civil court by the cyclist, even though she is clearly not to blame. What advice would you give? You are absolutely right. Shamefully, the insurer has advised her to settle in order to avoid the time and the legal costs of a court case. She must ignore this advice and must take the matter to court, using Small Claims herself if her insurer refuses to back her, and must, with your help and the help of the other witnesses, clear her name. https://www.gov.uk/make-court-claim-for-money / If she doesn't, she will be permanently on record as being partially to blame for injuring the cyclist and this will affect her insurance premiums for many years to come. I have been considering getting a KIA Venga. Because of my age, operating the clutch is starting to hurt my left knee. I looked up the Internet for Venga automatics and was horrified to see the reports of poor petrol consumption: as low as 25mpg. Is this to be expected or is it confined to the Venga? The cases quoted referred to the 4-gear torque converter. I believe that about 2015 they were fitted with 6-gear dual clutch boxes, but can find no "real life" consumption figures for these. Do you have any records for this car? I was expecting a consumption of 35 - 40 mpg. Was I being too optimistic? I would value your comments. Our Real MPG for the Venga auto is a combined figure for both transmissions. It's 31.3mpg: /realmpg/kia/venga-2010/16-automatic / Curiously, the combined Real MPG for the identical Hyundai ix20 automatic is much better at 36.1mpg: /realmpg/hyundai/ix20-2010/16-automatic / All depends on how the cars are used. If much of the use is cold starts then runs to a supermarket 3 - 5 miles away the fuel economy will be heavy. We have yet to include the alternative of the new Honda Jazz 1.5iVTEC CVT-7 in Real MPG. But a reader reported up to 45mpg from his. I actually have a 2010 Honda Jazz 1.5iVTEC 5-speed torque converter auto in Thailand (a model built, but not sold in the UK). On a recent 300 mile run, fully laden, it turned in 15.9 kilometres a litre, that worked out at 45mpg, but this plummets to 35-36mpg when the car is used solely in traffic. We have a 2011 VW Caddy C20 Life TDI 102PS Automatic (bought second hand the day before the emissions scandal in September 2015). We bought it basically because we wanted a 7-seater car and one that when needed could seat 5 people and still take an electric wheelchair (without passenger) and fold-up wheelchair and three wheeled walkers all at the same time. So it suits our needs well. It has done 30,000 miles. We live in Jersey, but are likely to return to then mainland next year and have to go through all the hassle of re-registering it with DVLA and I understand this will mean us not being able to use the vehicle for about 2 weeks during the change-over process. We don’t know whether to leave it here and start again when we get back (we would only need a five-seater then, but still need the mobility aid space). With EU6 regulations being a consideration as well, would you recommend we leave it here or bring it back with us? What vehicle would you recommend if we did decide to sell and buy? (It doesn’t have to be Automatic, but that is useful.) We are not “car people”. Don’t change unless we have to, don’t need all the latest gadgetry and connectivity, etc. A car is a practical beast to cart us and our belongings from A to B. Three of us…husband and I (I use the electric wheelchair) just 60 and 90 year old disabled mother-in-law (she needs the fold-up and walker). Even though we are not car people, for some reason I always read your column in mother-in-laws Telegraph. Living in Jersey (9 miles by 5) I'm actually surprised that you have not run into DPF regeneration problems with your Caddy diesel DSG. But re-registering it in the UK will be relatively straightforward. It isn't EU6, but will be EU5 (not that this helps much), so faces bans and penalties for entering a number of city centres from late 2019. But a Caddy Maxi Life is a big car and nothing with a petrol engine (apart from a Caddy Maxi Life with a petrol engine) is as commodious. A Citroen C4 Space Tourer (new name for the Picasso) 1.2 Puretech 130 comes close and is available with a 6-speed manual or EAT6 6 speed torque converter auto. No hybrid mini-vans like the Toyota Estima and Alphard hybrids officially available in the UK, though there are a few independent imports. Who do they think they’re fuelling? Why is it that magazines, the press and manufactures are allowed to print the most ridiculous figures for mpg in cars that have some electrical assistance? For example, the Hyundai Ioniq PHEV is quoted as 256mpg, a figure which even the magazine (Auto Express) says should taken with a pinch of salt, because when they tested it, they managed only 71mpg. There may be some believers out there who are going to receive a big shock. Should not all these cars be tested in the real world first? Because the NEDC lab test drive cycle is only 11 kilometers and thus favours plug-in hybrids. This is being rectified by the WLTP / EU6d Temp tests compulsory from September that give a more realistic figure and by the subsequent Real Life MPG test due by 2020. In January last year I bought a July 2014 Toyota Avensis Tourer with the remainder of its 5 year warranty from a Toyota Main Dealer. On collection, the service book was missing, but I was assured it would follow. It was eventually provided nearly 6 months later, but was not the original. It showed one service at 9 months and 15,000 miles and a second a month before I purchased the vehicle at 30 months and 35,000 miles. The sales manager said that they had been unable to obtain the original and that a replacement had been constructed from searching all Toyota on-line service records. They asked for further time to try to obtain the original records, to which I agreed. They maintained that the manufacturers warranty was unaffected by the absence of servicing but, being unconvinced, I opened correspondence with Toyota. They stated that any fault that could be occasioned by inadequate servicing would not be covered, although other faults would be. The dealership acknowledge that a purchaser would expect the vehicle to be serviced according to the Toyota schedule. Can I now reject the vehicle on the basis that it does not fully conform to the contract for sale and that, once out of warranty, problems may arise due to inadequate servicing? Or is there some alternative avenue to explore? Most manufacturers now centralise their service records and it seems that is what happened in your case. The Toyota dealer will have obtained the details of the 9-month/15,000 mile service and the 30 month/35,000 mile service from these records. If they don't confirm to the terms of the Toyota warranty you can reject the car as being fundamentally faulty before you took possession of it. I'd like to buy a new car this year (new or ex-demo). Having had 2 brand new BMWs break down on me in 2013 (total of 4 times due to the same problem), I bought a 2-year old Audi A1 as an ‘interim’ car nearly 4 years ago. Although I still love the feel of BMW I am too scared to buy again. I like the Audi 3 5-door hatch, but saw your comment this weekend about KIAs. I commute 100 miles a day on largely single carriageway roads, plus the A23 and A27. Only the last 5 miles is stop-start traffic, so I still want manual transmission. I don't like a hard ‘sports’ suspension ride. I will be trading in the A1 and a 3 year old MX-5 that I have had 9 months. What can you recommend? Important to me are: visibility, safety, reliability, comfortable ride. I'd like a sunroof, but is it worth ordering a brand new car just to get one? I'd wait for the new KIA Cee'd 1.4T GDI arriving later this year, with a 7 year warranty. For your ride comfort, get it on 16-inch wheels with 55 profile tyres: /carbycar/kia/ceed-2018/ If you can't wait, the Hyundai i30 already has a lot of the features, but a shorter 5 year warranty: /carbycar/hyundai/i30-2017/ Don't trade two for one. Either trade the A1 and use webuyanycar.com or wewantanycar to sell the MX-5 or use them to sell both cars. I am considering buying a six-cylinder BMW E46 - likely in coupe form. I believe they did 2.2, 2.5 and 3.0 litre versions. Are these engines sound? Is the auto box satisfactory when mated to these power units? Is there anything else in particular to look out for on these models? My wife has impaired mobility. Getting her a Peugeot 1007 with wide sliding front doors has been such a success that we now have one each so she can drive either car. But they’re both over 12 years old. Is there any newer vehicle on the market with sliding front passenger doors? Kia warranty is 7 years/100,000 miles, compared to Hyundai which is 5 years unlimited mileage. For a high-mileage driver doing more than 20,000 miles/year, the Kia warranty will expire before Hyundai. Hyundai also includes 5 years roadside assistance. Regarding the 'Suicyclist', while the cyclist should have noticed the car pulling across, in the strict interpretation "The official" rule is in the Highway Code - GIVE WAY to traffic already on the roundabout, or approaching from the right, UNLESS road markings/signs indicate otherwise." Now, the stationary driver should not have signaled the driver to emerge from the road on the left and they should not have done so without looking first. I suggest that the female driver mentioned would be lucky to get blame attributed at 50/50, despite the cyclists putting themselves in harm's way.